One of winter’s greatest treats? The availability of winter squash! Learn all about them—and pumpkins, too—right here. Our winter squash tips include descriptions and how to choose the best at the market. Then you can enjoy their flavors in soups, stews, rice dishes and more. We have lots of tasty butternut squash recipes, as well as a helpful video on how to cook spaghetti squash. And if you’re a fan of pumpkin desserts, definitely check out our scrumptious pumpkin pie and pumpkin cheesecake recipes! Select firm winter squash that feel heavy for their size. Their rinds should be free of blemishes and soft or moldy spots. The hard rinds on winter squash allow them to be stored longer than summer squash. Store in a cool, dry, dark place for 1 to 2 months. Do not refrigerate or wrap in plastic. Larger squash keep longer than smaller squash. Once cut, wrap pieces tightly in plastic wrap and refrigerate for up to 5 days. Acorn: Acorn-shaped with ribbed, dark-green skin, this winter squash weighs 1 to 3 pounds and is about 6 inches in diameter. Acorn squash have orange flesh with a sweet flavor that is often eaten directly from the shell. Butternut Squash: This cylindrical squash has a slightly bulbous base and beige skin. It weighs 2 to 5 pounds and has orange-yellow flesh with a sweet, slightly nutty flavor. Pumpkin: Actually not a squash, though a member of the gourd family, pumpkins are round with orange rinds. They range in weight from a few ounces to hundreds of pounds. Their orange flesh has a mild, sweet flavor and contains edible seeds. Smaller pumpkin varieties are used for cooking, such as Sugar Pie, Baby Bear and Cheese pumpkins. 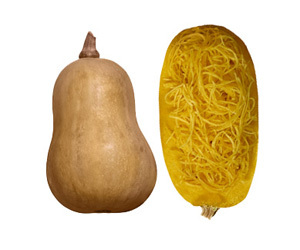 Spaghetti Squash: Watermelon-shaped with creamy yellow rind, spaghetti squash weighs 4 to 8 pounds and has pale yellow, mild-flavored flesh that separates into spaghetti-like strands when cooked. It’s often served topped with a sauce like pasta. Wash winter squash before using. Cut into halves or quarters with a large knife. Scoop out and discard the seeds and stringy fibers. Peel and cut into cubes or slices for boiling, baking or steaming. Winter squash halves may also be left intact and baked or microwaved. Simmer cooked, puréed winter squash with chicken broth and a touch of cream and cinnamon for a superb autumn soup. Add a touch of brown sugar and butter and a sprinkle of chopped PLANTERS Pecans to winter squash halves and bake for a delectable side dish. Stir cooked cubed winter squash into seasoned rice or couscous. Add chunks of winter squash to stews for a touch of color and sweetness. Enrich cake, muffin, quick bread and pancake batters with cooked, puréed squash. Stuffed hollowed-out squash halves with cooked rice or prepared STOVE TOP Stuffing Mix and bake for a hearty side dish.